Sure, he barely looks a day old. THEY ARE IN pretty much all of your childhood photos, being held tightly and dragged around everywhere with you. A moment’s separation could bring on the tears of a lifetime of grief. Nothing conjures up more memories of your early days than the prized childhood teddy or doll. No matter what age you are, there is always a lingering, somewhat nostalgic connection to these stuffed toys. The inexplicable attachment makes us want them to last forever. 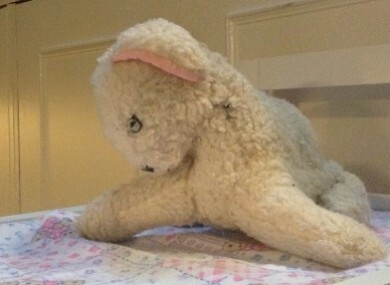 As with all good things though, time can take its toll on our furry friends, as it has done on my childhood teddy, Lamby. (He’s a lamb, in case you hadn’t guessed. Yes, imaginative child). Nobody in my family really knows where Lamby came from. But what we do know is that I brought him around with me everywhere I went when I was a child. I loved him. Actually, I still do. My mother thinks my aunt made him for me. This adds up as the owner of Dublin’s Doll Hospital and Teddy Bear Clinic, Melissa Nolan, said she thought Lamby was homemade or perhaps craft bear. That fact makes me appreciate him more – to know that someone stitched him up (rather amateurishly) by hand and that he may be one of a kind. Ireland’s only doll hospital and teddy bear clinic closed its doors on Georges Street in Dublin two years ago but reopened due to public demand on the top floor of the Powerscourt Centre, just off South William Street. Nolan said there was several offers of premises around the country and at one point it was flagged that the store could be moved to the new Children’s Hospital. “That was the plan, but with all the mix up about where the Children’s Hospital is going to be located and the to and fro, that isn’t going to be the case now,” said Nolan, who admitted that it is a shame as it would have been a good fit to have the hospital and the teddy museum under the same roof. When I brought Lamby in, just like any sick patient, he was placed on a trolley while Nolan printed out his medical chart. “He’s in pretty bad shape,” she said, but added that they could work wonders on him. Nolan has run the store with her husband for the past 28 years, and over the years she has heard a lot of stories from people about the favourite dolls and teddies. “Our customers are both young and old. We get children into the shop, but we get many adults that are bringing in their teddies and dolls, who have seen better days, to be restored,” she said. We have had husbands in who want to give their wives a nice anniversary present by restoring their childhood teddy to their former glory, but also adults who want to pass on their teddy to their children. “One touching story was a mother, who wanted to surprise her daughter with a gift of her childhood teddy. Her daughter’s husband had recently passed away, and she thought it would be a nice thought to get her daughters teddy re-done, to cheer her up, in what little way she could. I thought that was nice,” added Nolan. The store also sells elaborate doll’s houses. These hand-crafted houses are the things little kids dreamed of when they were young – full of furniture and miniature dolls. Many of us, however, would not have been lucky enough to have one as they can be expensive, ranching from anything over €300. We find that actually many people who buy these are older. They are women who always wanted one as a child and who now have the money to buy one of their own. We have also had older children come in and buy these for their mothers as they know it is something she has always or said she wanted as a child. Other customers have been people who say they never had a doll or teddy. “It’s a nice and thoughtful gift for someone, and it really does mean a lot to people,” said Nolan. I was anxious to know how long Lamby would be in hospital for and also I was worried that perhaps he would be restored too well. What if I don’t recognise him? I only had to wait seven days before pick-up time. I was beyond pleased with the results. Lamby’s coat was soft and fluffy, and he was treated to the good wash he badly needed. His stitching was brand new and he had new stuffing put in. But Lamby isn’t the only casualty of childhood that has been spruced up by the hospital. Check out some of their latest patients. The shop in the Powerscourt Centre is quaint and filled with beautiful teddys, dolls and dolls houses – a shop that any child would love to visit. The shop is home to some very old teddy bears too, like this one, which is from 1912. While Nolan says that commercially she would like to make money on the business, it’s not really about that for her. She says she is keen to open a museum in a new space, stating that she has the largest teddy bear collection in the country, clocking up over 100 teddy bears. They are all in storage. We had room to display them in the George’s Street premises, but not here, it’s just too small. It is such a shame to have them wrapped away for no one to see. They were featured recently at an exhibition in The Ark and it proved very popular. I think there is an opportunity, be it for tourism or just for kids to get to see them, to have a dedicated teddy bear museum here in Dublin. “Many cities have a teddy bear museum and it would be a great asset to the city,” said Nolan. If you would like to get your teddy or doll revamped, call into the Doll and Teddy Bear Hospital on the top floor of the Powerscourt Centre, on South William Street in Dublin. Prices can vary depending on the teddy or doll and the work that is needed. Just give Marissa a call and she is happy to help. They are open from 11am-5.30pm. You can call them on (01) 675 3878. You can visit their website here or their Facebook page here. Email “From old to new: My childhood teddy Lamby pays a visit to the Doll and Teddy Bear Hospital ”. Feedback on “From old to new: My childhood teddy Lamby pays a visit to the Doll and Teddy Bear Hospital ”.